Kids can be absolutely adorable, but they can also be little monsters when they’re having a bad day. 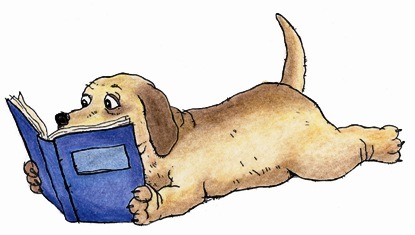 That’s what happens in Samantha Berger’s new over-sized picture book, Crankenstein. In it, a little boy wakes up in a cranky mood, scowls at the sun, and gets progressively crankier as the book goes on. Absolutely everything makes him cranky: He growls at his pancakes (there isn’t enough syrup) and he growls when it’s time to go to school. He growls when it rains outside and he growls when the sun comes out and melts his popsickle. In fact, Crankenstein growls MEHRRRR!!!! at any- and everything, except… Well, I won’t tell you that. You’ll need to read the book to find out. 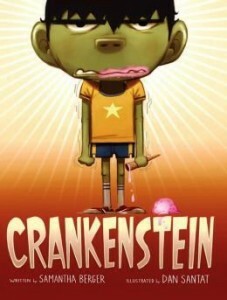 Crankenstein is big, monstrously-cute, in-your-face picture book that your own little crankenstein won’t soon forget. Ms. Berger uses short and delightfully funny sentences to introduce some very realistic circumstances every cranky child on earth should be able to identify with. Like when Mom tells you it’s bedtime and you’re not even sleepy; or when you’re freezing in your flimsy Halloween suit; or when you have to take some gross cough medicine. Artist Dan Santat’s over-sized illustrations are a picture book lover’s delight. He captures the essence of the true crankenstein by offering a wide array of cranky facial features in a wide range of colors: Glaring yellow eyes, pink sniveling lips, icky-green skin, and the quivering hands of the infuriated little boy as absolutely everything puts him into a cranky mood. This book should be a big hit with children everywhere. It should do well in a pre-school nursery, a kindergarten classroom at naptime, or during quiet time in front of the family fireplace. It can also be used as a jumping-off point for conversations about crankiness, “good moods” vs. “bad moods,” and getting control of one’s emotion.